To register – Click on "Holiday Club Booking" at the top of the page, to review the holiday programme then click "Book now". Please then Register as a new user. How do I know if you have available spaces? You can look at availability on the booking portal. The system is very flexible and (subject to availability) you can book for individual sessions or for the whole of the Holiday period. Can children attend before they start school? Yes. We are able to have children attending the holiday club from their 4th birthday. 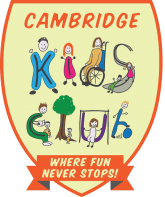 Can children attend from outside of Cambridge? Yes. For holiday clubs it doesn't matter which school your child attends. No. We do offer the Early Bird Booking which is available when holiday club sessions are booked 5 working days in advance. Within 5 days of the requested sessions there there is a late booking rate. What if my child cannot attend at short notice? Please inform the club they are booked into or head office and we will inform the club on your behalf. Non-attendance with 48hours notice will still be charged at the daily rate. What activity itinerary is there? We create an exciting programme of activities which is emailed to parents approximately 1 month before the holiday club starts. Activities are not compulsory for children to do and free play is available all day. There may be some changes to the activities listed at short notice depending on the flow of the club that day. Yes, all children booked in on days when there are trips must attend the trip. We do not have enough staff to leave children at the club whilst others go on the trip. Please provide your child / children with a nutritious packed lunch (in a container with your child’s name on and a cold pack). We will provide the children with a healthy morning snack and a light afternoon tea. For trip days please try to make lunches as disposable as possible and look out for reminders of what the children need for individual trips. What do I need to bring with them? We also suggest a change of clothes (especially on the days where we are planning water play), sun cream, sun hat and a rain jacket daily.